Lesley Hinz (with Sue McDonald at right, also coached by hubby Tom Hinz) shows off her latest mile world record. 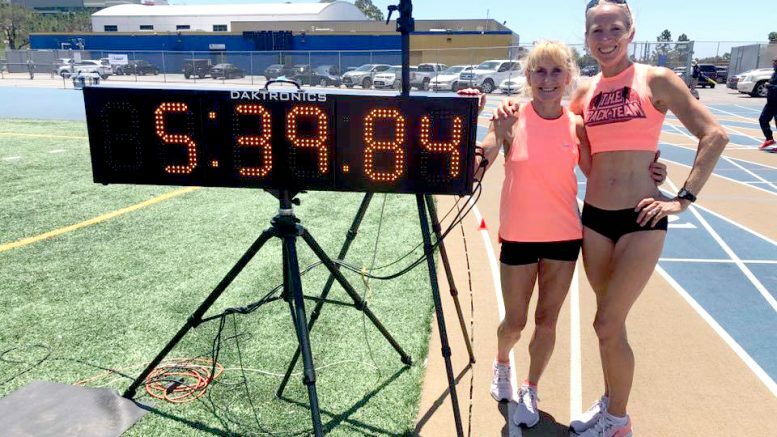 Despite sprints run into winds, at least two world records and two American records were set over the weekend at the USATF West Regional Masters Championships at West Los Angeles College. (See results here.) Traveling from Georgia, W60 Lesley Hinz ran the mile in 5:39.84 to beat the listed WR of 5:42.65 by Kathy Martin in 2013. So Lesley has a complete set, having set the indoor mile WR (5:43.75) at North Carolina nationals in March. That was Saturday. Sue McDonald went from hep to high jump to marathon to 800 record-holder. On Sunday, she ran the 800 in 2:34.60 — just missing the listed WR of 2:33.09 by Germany’s Lidia Zentner in 2013. (But it lowers the listed American record of 2:34.66 by Sabra Harvey at 2009 Oshkosh nationals.) Lesley’s splits were 75.8 and 78.7. Lesley’s friend Sue McDonald — a former champion high jumper!— broke the W55 AR in the 800, clocking 2:28.88 (with negative splits of 75.5 and 73.4). The listed AR is 2:30.53 by Jane Arnold in 1996. On Saturday, a SoCal TC men’s 4×800 team of Frederick Lindsley (73), Grady Cash (70), Tim Wigger (70) and Salih Talib (73) clocked 11:03.5 to shatter the listed M70 WR of 11:09.87 set 20 years ago by Jim Selby, Alfonse Escobar, Gunnar Linde and Avery Bryant at Orono nationals. Also notable was M60 Val Barnwell running the 100 (12.11) into a 1.5 mps wind and 200 (25.71) into a 2.7 gale. Wow, what a wild ride these past 3 years have been! First chasing down the American Record for W50 in the high jump and then runner-up at masters worlds in Lyon 2015, then to get to the point where I couldn’t jump anymore (35 years of high jumping will do that to you). What do you do when you can’t jump? Well, you run long and slow — at least that is what I thought I should do —until I discovered that long distance running wasn’t the best activity for me to do for my torn hip labrum, which caused me to retire from the high jump in the first place. But I had already committed to trying to qualify for Boston so I did. Once I qualified, I realized what a marathon does to a 55-year-old beat up body and was going to pull out but my running friends persuaded me not to! As a former heptathlete, my best event was the high jump, but my second-best event was the 800 meters. So as a masters athlete, we always look up the age-group records and what I saw was something I could achieve. So a couple of weeks after Boston, I started on my journey to break the American Record in the W55 800 meters. I had done absolutely no speed training for two years because for Boston, my goal was just to finish and come away uninjured. And I accomplished that. I entered the USA Masters Nationals in the 400 and 800. I had not run a 400 in two years, and the last time I ran an 800 was a decade ago! This weekend was my very first track meet of the season and the first meet in two years! Today, I broke the American Record in the W55 800 meters with a time of 2:28.88 (age-graded at 92%). This record was 22 years old and the mark is currently #1 in the world rankings! Woo Hoo!!! Happy Dance!! 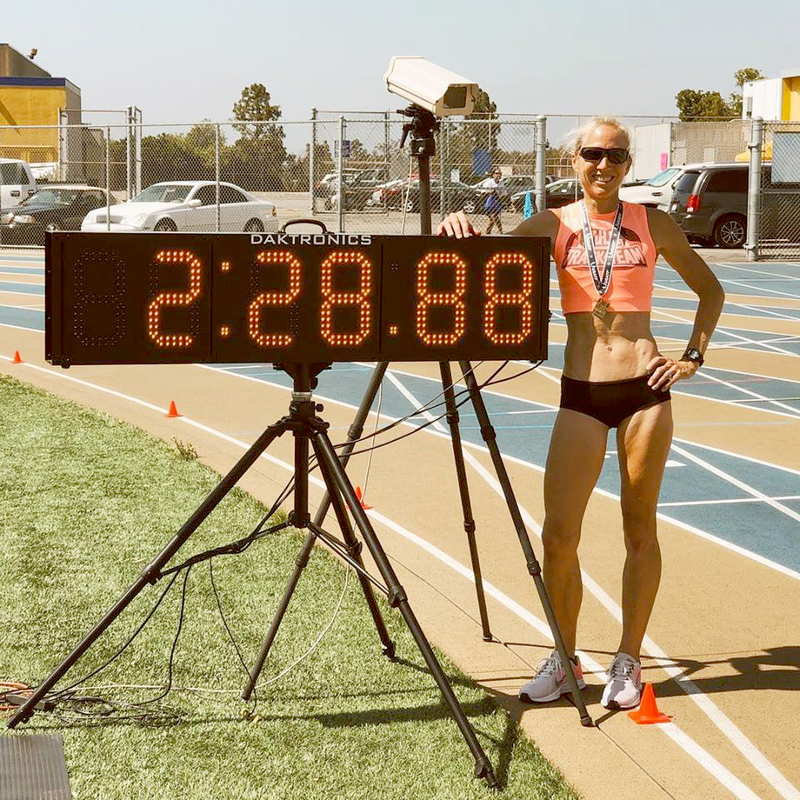 A big congratulations to my coach, Tom Hinz, as he had two athletes break American Records and one athlete, his sweet wife, Lesley Hinz, break the world record in the Mile (W60) this weekend at 5:39.84 and the American Record in the 800 meters at 2:34.60 (both age-graded at over 100%)! A huge thank you goes out to my team — my coach Tom Hinz, my chiropractor Benjamin Holt, my massage therapist Larry Rodriguez, my acupuncturist Minka Robinson Stevens and my husband, Micha. I’m also late in reporting a W55 American record in the 4×100 and several other major records at the Pride Meet in San Francisco. Been busy lately. Stay tuned. The listed W90 AR is 31.53 by Zora Lux in 1995. The listed WR is 23.15 by Japan’s Mitsu Morita in 2013. Be the first to comment on "Lesley Hinz adds W60 WR in mile, AR in 800 at USATF West Regionals"